For Katie's scrapbook layout this month, she has focused on a Mother's day theme and has incorporated the lovely addition of stitching to add a fresh, new element to her design.Scrapbooks are such a diverse crafting project, you can use a range of paper craft collections and embellishments to gain the right effect. With our selection of products, you are sure to find the right materials to compliment your photos and memories. Firstly, choose four coordinating sheets from the Simply Creative Folk Song 12x12 paper pad. Rip each sheet diagonally, each sheet a different size the smallest roughly 11cms from the corner. TIP: By ripping the paper, the scrapbook will be left with a rustic look. Glue each sheet together from large to small, ensuring that you can see each sheet. Carefully punch a line of holes on each sheet using a paper piercer then stitch along each layer. Once complete, glue to the top left corner of a page from the First Edition 12x12 Love Story paper pad. Cut a piece of 8cm x 13cm Simply Creative paper and trim your chosen photo to size. Make sure that your Simply Creative cut out is bigger than your photo, so that it acts as a border. Mat and layer on your Simply Creative rectangle. Cut out a 7.5cmx9cm piece of kraft card and cut the two corners on one end to make a tag. Stitch along one corner before adhering to your layout. Cut out a 9.5cm x 16cm rectangle from the Simply creative paper collection and stitch down the side before gluing over the tag. Cut out two squares from the Simply Creative pad, one 11.5cmx11.5xm and one 9cmx9cm and layer together using glue. Layer your photo and border on top of this, ensuring it is centred. Tear off two strips of washi tape and layer together at the side of the larger square to add a collage effect. Tear off two smaller strips, place one to the top right and bottom left of your scrapbook layout and then stitch along them. Die cut out the word ‘Mum’ using the Varsity Alphabet dies and glue to the top left of your 11.5cm x11.5cm square before stitching over the centre of the title. Finish off by gluing sequins and gems along the edge of the layers to add colour and interest. The use of stitching adds a textured element to your scrapbook, and if you enjoy this technique, you could stitch more of your memories together to gain a collage effect. 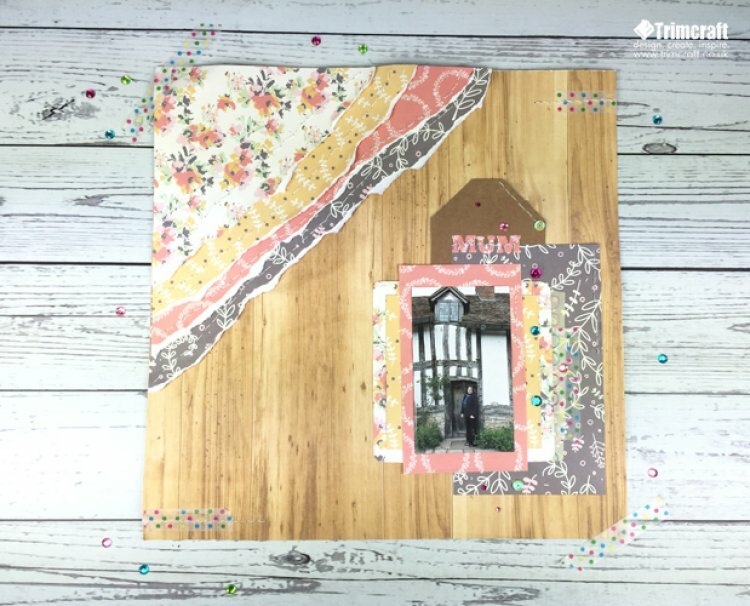 We would love to see your Mothers day Scrapbook layouts, remember to upload your marvellous makes to the project gallery.